San Jamar Clear Plexiglas Disposable Glove Dispenser, Three-Box, 18w x 3 3/4d x 10h - Disposable glove dispenser prevents boxes from becoming damaged or contaminated, and keep gloves sanitary and handy for use. 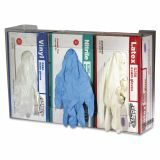 Innovative spring-loaded "hug" design ensures a secure fit with glove boxes. 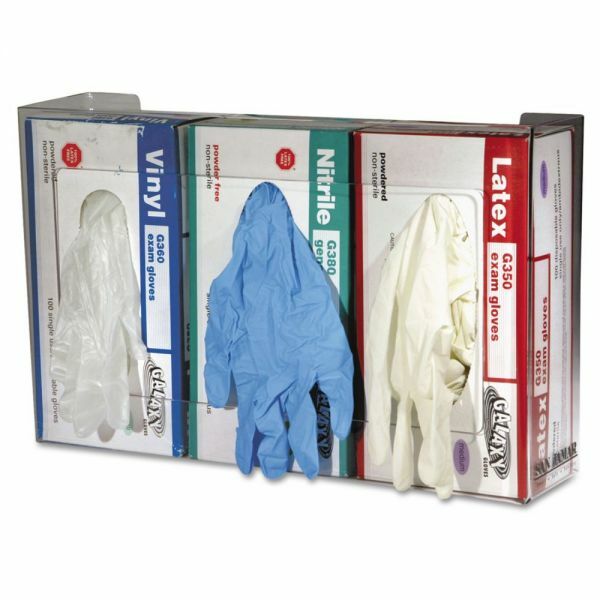 Triple-box dispenser is ideal for holding multiple sizes of gloves. High-grade, flexible Plexiglas® lets you view contents. With keyholes for easy wall mounting.